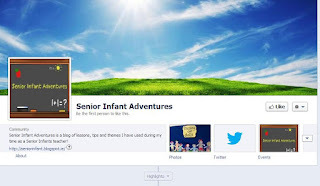 Senior Infant Adventures in Learning: 'Like' or 'Follow' Senior Infant Adventures Today! 'Like' or 'Follow' Senior Infant Adventures Today! Spread the word about 'Senior Infant Adventures' and keep up to date on all new posts and resources by clicking on the image below to 'Like' us on Facebook! Or if Twitter is more your style, check out our Twitter account for the latest news and new posts on Senior Infant Adventures!